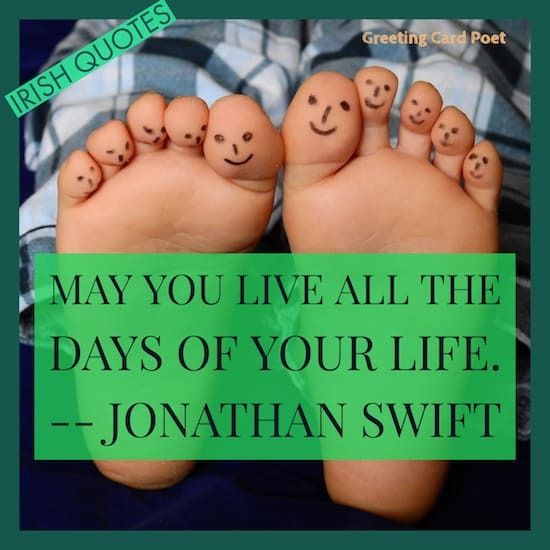 You’re on Irish Quotes, page 3 of 6 Irish Blessings, Quotes, Toasts & Sayings. See related pages below at bottom. 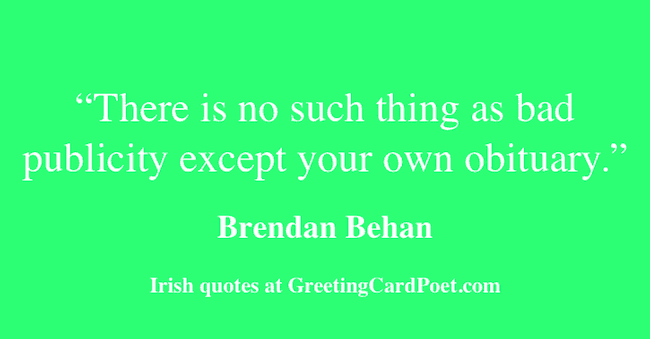 Irish quotes includes a collection of funny sayings from the likes of Oscar Wilde, George Bernard Shaw and others. Words of wisdom to brighten up your Irish days. I only drink on two occasions — when I’m thirsty and when I’m not. When I came back to Dublin I was court-martialled in my absence and sentenced to death in my absence, so I said they could shoot me in my absence. No strangers here, just friends you haven’t met! Being Irish, I always had this love of words. May love and laughter light your days Irish in so many ways. When I die I want to decompose in a barrel of porter and have it served in all the pubs in Ireland. There is an Irish way of paying compliments as though they were irresistible truths which makes what would otherwise be an impertinence delightful. I think the Irish woman was freed from slavery by bingo…. No human being believes that any other human being has a right to be in bed when he himself is up. I’m troubled, I’m dissatisfied. I’m Irish! You know it’s summer in Ireland when the rain gets warmer. One wonders in this place, why anyone is left in Dublin, or London, or Paris where it would be better, one would think to live in a tent or hut, with this magnificent sea and sky, and to breathe this wonderful air which is like wine in one’s teeth. it’s all in how you make it! The only man I know who behaves sensibly is my tailor. He takes my measurements anew each time he sees me. The rest go on with their old measurements and expect me to fit them. Life is no brief candle to me. It is a sort of splendid torch which I have got a hold of for the moment, and I want to make it burn as brightly as possible before handing it on to future generations. I often quote myself. It adds spice to my conversations. A man who loses his money gains, at the least, experience, and sometimes, something better. A life making mistakes is not only more honorable, but more useful than a life spent doing nothing at all. I have the simplest tastes. I am always satisfied with the best, and I can resist everything but temptation. Murder is always a mistake…One should never do anything that one cannot talk about after dinner. I like Wagner’s music better than anybody’s. It is so loud that one can talk the whole time without people hearing what one says. The good end happily, and the bad unhappily. That is what fiction means. What they like is to be a man’s last romance. Check out our Big Merry Christmas page with wishes, greetings, quotes, funny quotations, images and jokes. There are no strangers here, only friends that have not yet met. The intellect is forced to choose: Perfection of the life, or of the work. 6: Happy St. Patrick’s Day!